Migo (Channing Tatum) is a yeti who lives in a complex Bigfoot community atop a mountain in the Himalayas, where they are raised to believe that their world is being held up on the backs of giant mammoths and there is nothing below the clouds. Migo’s father (Danny DeVito) has the job of banging a gong with his head every morning to wake up the giant snail that they are made to believe lights up the sky. The villagers are forced to follow the rules that have been laid out for them on a collection of stones that are worn like a shall by the Stonekeeper (Common), and one of these stones dictates that the “smallfoot” doesn’t exist. The “smallfoot” is, of course, what they call humans. When Migo discovers one of us, and decides to tell the village what he saw, they are reluctant to believe him and he is promptly banished by the Stonekeeper, who fears what will happen to the natural order if the villagers discover that the stones can, in fact, be wrong. Teaming up with Meechee (Zendaya), the Stonekeeper’s daughter who is secretly part of the Smallfoot Evidentiary Society and has been trying to find proof of this mythical creature for years, Migo decides to venture below the mountain, in an attempt to bring back proof. This is where he meets Percy (James Corden), a TV host with failing ratings who sees yeti footage as his ticket back to the top, but when Migo brings the human back to the mountain, they are forced to reevaluate everything they believe. On the one hand, Smallfoot is a cute animated musical from Warner Animation Group that treads a fairly predictable narrative path and seems geared towards younger kids with its broad use of slapstick humour. But on the other hand, it’s a transgressive takedown of overly dogmatic religious beliefs that also explores the residual fallout from colonialism and genocide, with a message about division and the dangers of fearing those that are different from us. It’s not exactly deep, but it is heavier than expected for a film about yetis who believe humans don’t exist that has a groaningly obvious pun in its title. 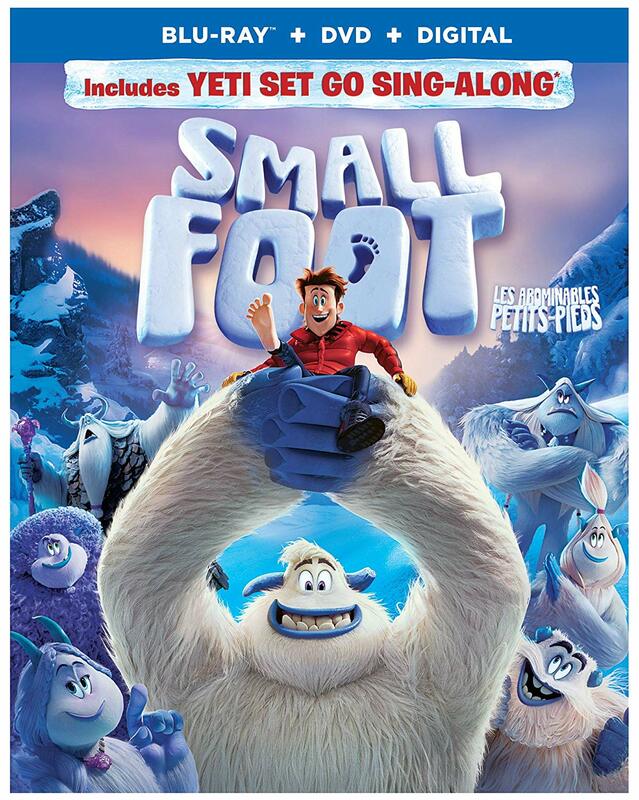 While some of these themes will likely fly over the heads of kids, and the execution conversely feels a bit too simplistic for adults, the fact that Smallfoot has more going for it than initially meets the eye does count for something. The decent animation and appealing character designs keep the film pleasing to look at on a visual level, and it’s entertaining enough while watching it to make it worth a look. The Blu-ray also includes a sing-along version of the movie, as well as the new mini-movie Super Soozie, the short film Migo in the Secret of the Yeti Stones, a “making of” featurette entitled Yeti or Not, Here They Come! Imagining Smallfoot, and the music videos for “Finally Free” by Niall Horan, “Moment of Truth” by CYN, and a compilation of the song “Wonderful Life” in 28 different languages. Smallfoot is a Warner Bros. Home Entertainment release. It’s 96 minutes and rated G.